Dishonored 2 review: "An immersive power trip no matter how you choose to play"
Dishonored 2 is subject to what I'll call the 'BioShock 2 effect'. Because the first game fired on all cylinders, with a rich, original world, intoxicatingly empowering gameplay, and intricately woven story threads, there's little room for improvement in the inevitable sequel. And while you're essentially getting more of the stellar same in this first-person, stealth-action follow-up, it doesn't sparkle with the sheer newness that made the first one feel so special. Regardless, Dishonored 2 is a fantastic game in its own right, even if it doesn't revolutionize the fresh ideas put forth by its predecessor. This tale of systematic revenge imbues you with all the tools, tricks, and tactics you need to feel like a super-powered assassin, delivering an immersive power trip no matter how you choose to play. It's been 15 years since the events of the first Dishonored, and under Corvo's guidance, little Emily Kaldwin has grown into a regal but dispassionate Empress. Her boredom is broken by the arrival of Delilah, the supposed sister of Emily's slain mother who's come to usurp the throne in Dunwall. At the onset, you're given a choice between our two protagonists - Corvo or Emily - with the other turned to stone during Delilah's coup, forcing you to stick with your pick for the remainder of the campaign. Playing the first Dishonored and its substantial DLC is practically a prerequisite here; without the context from Corvo's undertaking or Daud's behind-the-scenes perspective, newcomers will probably have no idea what's going on and miss the full impact of Dishonored 2's rapid-fire story beats. Emily and Corvo each have a unique set of supernatural abilities granted to them by the mark of the enigmatic Outsider, but both are equally adept at skulking around, sniping enemies with a miniature crossbow, or clashing with alerted guards in close-quarters sword fights. In terms of traversal, our heroes are pretty much identical - Corvo's Blink teleportation and the shadowy tendril of Emily's grapple-like Far Reach function in much the same way - but their other abilities provide plenty of creative ways to elude or eviscerate your adversaries. Some powers (and their clever upgrades) are definitely more satisfying than others, and you may start to rely on your favorite combinations before long, but the sheer number of possibilities they offer is a source of continuous excitement for the next encounter or upgrade. Best of all, using Void magic to adeptly execute your approach - or quickly adapt when things don't work out the way you planned - is immensely satisfying, whether you're rendering a room of guards unconscious, tearing them apart limb from limb, or sneaking past them entirely undetected. You even have the option (complete with Trophy/Achievement incentive) to reject the Outsider's powers altogether, a unique challenge that highlights melee duels, close-range gunplay, and smart use of your many mechanical contraptions. Once again, the cadence of acquiring new powers is directly correlated to collectibles, which can be satisfying or irritating depending on your patience for seeking out some cryptically hidden trinkets. In terms of overall refinements, one of the biggest improvements to Dishonored 2's core combat is the ability to go for a non-lethal knockout after parrying an incoming attack - so pacifist players don't need to immediately revert to a Quick Save if they wind up alerting a few goons (though perfectionists will definitely appreciate the simple, efficient Quick Save system that's baked into the pause menu). The non-lethal approach also gets a much-appreciated buff in the form of drop attacks that can end with your prey unconscious rather than dead and/or beheaded. More bloodthirsty assassins should appreciate the return of truly gruesome executions, which look even more painful thanks to Dishonored 2's spectacular animations. As in the first game, each level is a self-contained district full of vermin, Victorian architecture, and wide-open vistas moderately populated by civilians and armed guards. Fleeing from Dunwall, you lay low in the balmy, bayside city of Karnaca to devise a plan for taking down Delilah and her conspirators. It's easy to become transfixed by Karnaca's sunny climate and seaside views, as you soak up Dishonored 2's lush visuals that blend the original's stylized proportions with crisp, palpable textures. The change of steampunk scenery is certainly appreciated, though the layout of Karnaca feels awfully similar to Dunwall, only with mountains, verdure, and favelas in the distance in place of grimy smokestacks and skyscrapers. Because you typically don't revisit stages after you've eliminated your target, you don't get a great sense of Karnaca as an interconnected whole - though you also don't have to deal with the tedium of backtracking. And despite the segmented progression, the sense of atmosphere in Dishonored 2 is just as stunning as the original. Myriad notes and novel excerpts scattered throughout each building, ornate interiors that perfectly play into sneaking along unseen, eavesdropped conversations, the environmental storytelling of objects arranged in little vignettes (like arrows through mannequin heads used as target practice, or exotic taxidermy arranged in manners most bizarre) - it all envelops you like a thick, aromatic smoke of flavorful world-building. You'll get lightheaded trying to sift through all the little bits of lore and backstory during your first run through, and Karnaca bears revisiting for its ambiance alone, on top of the potential to go for an alternate playstyle. The plot's brisk pace doesn't quite work in Dishonored 2's favor, because it seems to resolve its most intriguing mysteries and brilliant level mechanics almost immediately after they're introduced. There's a constant churn of fresh ideas and ingenious wrinkles which completely shape the levels that contain them, and I won't spoil their brilliance (any more than the Dishonored 2 promotions already have). But they end up as single-use gimmicks, and never accumulate into some grand, mind-expanding design. Nonetheless, it's always exciting to see what adaptations you'll have to make when presented with these complications, as you set out to accomplish your mission in whatever way you see fit. Morality is mostly a binary choice here: slaying your enemies throws the city in chaos, while showing them mercy (and uncovering some crafty methods for taking them out of the picture) results in a happier ending. 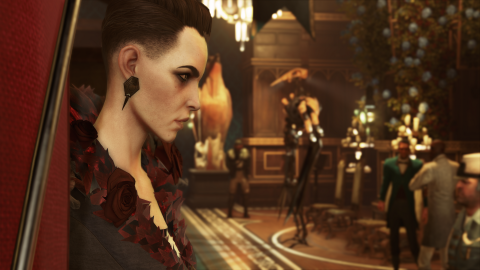 Dishonored 2 does try to expand the scope of your decision-making by letting you hear the dark secrets of any NPC with the return of the psychically whispering Heart. It's certainly a neat touch, but ends up having little significance: as in Watch Dogs, these insights into people's past wrongdoings are randomized, so they won't likely sway you from deciding to take or spare their lives. The Heart also provides some fascinating insights into how the villains turned out the way they did - though it feels a bit silly that whole minutes can be spent standing idle in front of an incapacitated antagonist, pumping the Heart for numerous drips of backstory before you really get a sense for who they are. In the end, any criticisms of Dishonored 2 feel like nitpicks of a thoroughly entertaining, mechanically complex, impressively realized world, just like the first. My primary playthrough as a stealthy, nonviolent Emily clocked in at over 15 hours - and though I sometimes found myself wishing for more character development in the overcrowded story, I was never for a moment bored with the otherworldly abilities of my agile assassin. With the potent possibilities inherent to its gameplay, ample replay value, and mesmerizing environments, Dishonored 2 certainly feels like more of the same - and that's a very good thing indeed. Description The sequel to the first revenge filled title.